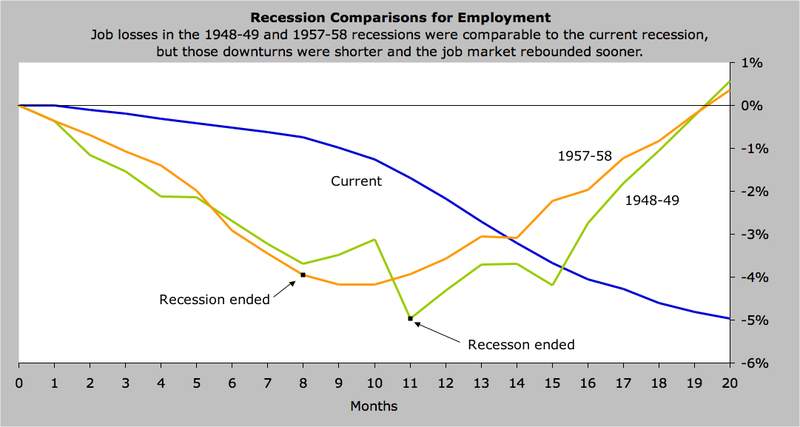 On September 21, 2009, the American Institute of Economic Research published Kerry Lynch's comparison of job losses in the recession that began in December 2007 to job loss in other recessions since the end of World War II in 1945. Payroll employment is down by 6.9 million net jobs, or 5 percent, since the recession began in December 2007. That decline is much worse than the average employment loss during a recession. There have been 11 other recessions since the end of World War II, and only two of them included similarly job losses. The key difference is that the earlier recessions were relatively short. The 1948-49 recession lasted 11 months and the 1957-58 downturn lasted only 8 months. By the time it is over, the recession that began in December 2007 will likely have lasted twice as long as any prior post World War II recession. The big question is how quickly jobs will be added once the recession ends.